Asking Alexandria is an English metalcore band from North Yorkshire that formed in 2008. 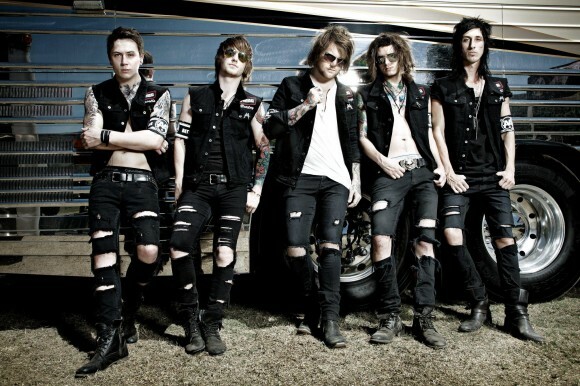 The current band members consists of Ben Bruce (guitar), Danny Worsnop (vocals), Cameron Liddell (guitar), Sam Bettley (bass), and James Cassells (drums). Asking Alexandria has released three studio albums, all with Sumerian Records. Asking Alexandria’s 2011 release was titled, Reckless & Relentless. The album debuted at No. 9 on the Billboard Top 200 charts. Asking Alexandria’s accomplishment also simultaneously marked the biggest first week sales for any artist in the history of Sumerian Records. They have been heavily reviewed in press and have earned cover stories in Kerrang!, Alternative Press, Revolver, Big Cheese, Rock Sound and Guitar World. One of their earliest music videos, “The Final Episode,” has now over 30 million YouTube views. Their latest album, From Death to Destiny was highly anticipated after the release of the albums first single “The Death of Me.” The album also consisted of their hit single “Run Free.” From Death to Destiny was the No. 1 independent album in America upon its release. The album also reached the Billboard 200 chart at No. 5 and made impressive chart debuts around the world, including in their home country, the UK.